The audience at Tuesday evening’s Archaeological Institute of America presentation at Boston University confronted some stunning evidence of what the chairman of the AIA Site Preservation Committee, Paul Rissman, calls “desecration.” Photographs of sites in Cambodia showed statues and reliefs smashed to pieces, stone heads and bodies hacked off by looters. These dramatic images were part of an informative presentation by Erin Linn of Heritage Watch, an NGO operating in Cambodia to prevent the loss of that country’s cultural heritage. The AIA Site Preservation Committee presented the program, called “Thieves of Time: Preserving Cultural Heritage in Cambodia.” Heritage Watch is the recipient of the AIA’s 2009 Conservation and Heritage Management Award, as well as a Site Preservation Grant for its work at Banteay Chhmar, a late-12th-century site in northeast Cambodia. Linn explained that Heritage Watch was using its funds from the AIA to try a different approach to site preservation at Banteay Chhmar. Heritage Watch believes that local people must become active participants in site management and protection, and Linn boiled down its philosophy on how to accomplish that to one word: education. Heritage Watch has set up an education program to teach those who live nearby about the importance of material culture, to explain that its preservation could lead to economic development through tourism, and to underscore its value as a resource to be protected, not ripped from the ground and the walls by looters. Protecting cultural heritage, however, is not simple in Cambodia. For many, the myriad temples and buildings that dot the countryside are a resource that is treated as fungible. Heritage Watch showed slides of temples devastated by looters who had hacked apart ancient masterpieces and destroyed their archaeological context, while collecting pieces that, Linn says, are sent mostly to unscrupulous dealers in Thailand. 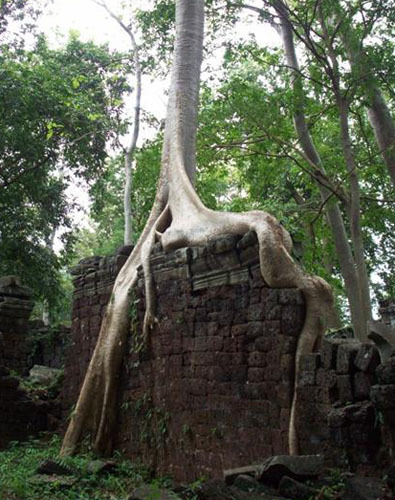 Heritage Watch is battling the looters in Cambodia. Its comprehensive program now in place in Banteay Chhmar includes English classes taught for four hours each day by a Heritage Watch teacher who lives in the village, as well as lessons on the cultural significance of the site and its history. Linn told the audience that Heritage Watch hopes that armed with the stories of the site and a bit of English, locals can become tour guides with the chance of more lucrative work. The AIA and Heritage Watch are not alone in combating the ravages of looting. The Honorary Consul General of Cambodia to the United States, Sovann Ou, attended the event on Tuesday to underscore Cambodia’s commitment to protecting its cultural treasures. Other prominent guests included Dean Virginia Sapiro, dean of Boston University’s College and Graduate School of Arts and Sciences and professor of Political Science. Also attending were AIA trustees Alexandra Cleworth and Shilpi Mehta, and former trustee and BU Professor, Robert Murowchick. The AIA also arranged for the distribution of an important resource in the fight for cultural preservation in Cambodia. In its premier presentation in North America, we circulated The Red List of Cambodian Antiquities at Risk, a publication of the International Council of Museums (ICOM). It is designed to assist museums, collectors, dealers in art and antiquities, and customs and other law enforcement officials in recognizing artifacts that may have been looted and smuggled from Cambodia. The objects illustrated on the Red List are protected under Cambodian law. The Red List was developed by ICOM, an affiliate of UNESCO, with input from Heritage Watch, and with support from the U.S. Department of State’s Bureau of Educational and Cultural Affairs. Educating the general public about the importance of site preservation is one of the core initiatives of the Archaeological Institute of America. Heritage Watch’s outside-the-box thinking is just the type of project that the AIA Site Preservation Committee likes to support. One of our goals is to fund sustainability in site preservation, and a way to do so is by getting the people who live in the area to understand the value of cultural sites. If they recognize their value, residents become the shareholders in the task. And the efforts of an entire village are likely to yield the best results. If you agree with this, please support our Site Preservation program. I lived in Thailand for 3 years. The tribes were very strong in the historical feeling. You would have to break this area to get people to co-oprerate in anything. The wats that are used are kept up/un-used wats are left to the elements all over the area. I work as a police officer in Sri lanka, but currently I'm in Timor-Leste (East-Timor) in UN mission as a UN Police officer. My role of duty is a radio technician. I like this job very much as well as archeology. Since my childhood I expected to be not only a police officer, but also an archelologist. While I was woking in Sri Lanka I tried to learn more on this issue. As you know, there are lots of sites remainng in my country; moreover, the world's most ancient cemetery is situated there. It is believed that this cemetery is older than 184,000 years. Finally, I believe that I may be given feedback by you that may encourage me to be an archaeologist.